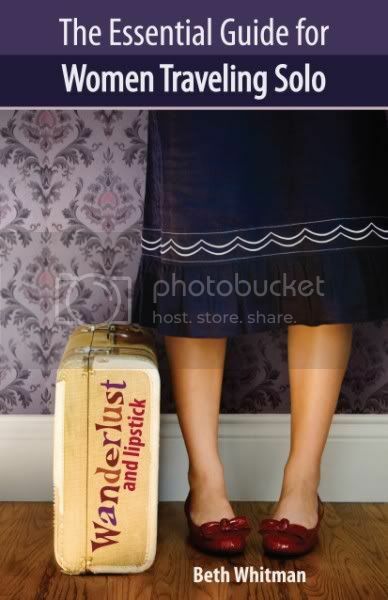 The Broke and the Bookish : Julia Reviews "Wanderlust and Lipstick: The Essential Guide for Women Traveling Solo"
Julia Reviews "Wanderlust and Lipstick: The Essential Guide for Women Traveling Solo"
Why I read this book: I love traveling. I am at that point in my life where I have no one to travel with me. I am a woman. When I saw the title of this book, I was in a particular funk. "Woe is me! I have no boyfriend to force to go to exotic places with me! What is a poor, soon to be out of college single woman with the travel bug going to do?" Then the heavenly search engine gods led me to this. "Hurray!" I cried, "I am a woman, I am solo, I have wanderlust! I must have this essential guide!" I don't know if I had it in mind that this was going to be the holy grail of travel experience, but upon hastily flipping though the pages right after checking it out of the library, I found myself slightly grounded. "But wait, I know all about passports and visas. I know how to pack. I call shenanigans!" While reading book, I found myself skimming over too many of the sections for me to have learned as much as I had hoped. Most of it is common sense for the seasoned traveler, even if you have never gone solo. There are some nuggets of good information, including a glossary of really handy websites. I found myself gaining the most useful tips from the anecdotes provided by women who have been there and done that. I never knew much about getting flown out of a country for medical treatment, but hearing the woman's story first hand about how it all turned out and the important role her travel insurance played is going to stick with me. If I had to resubtitle this book it would be "The Essential Guide for the New Woman Traveler" because that's really what it is. I would highly recommend this book if you are new to the international, and maybe even domestic, travel scene. It's not a bad book, just not what I was expecting as someone who though not alone has already done it. This sounds like a book I need to read regardless of some of the info is something I'll know! All these travelogues and travel books are making me need to plan a trip!! Great review, Julia! Yeah, I'd really like to see an advanced version of women traveling solo. Have you (or Jamie) ever read Rolf Potts' Vagabonding? I think that would be a great read! I should check this out too... I think I'm going to travel to NM solo in November so I'd like to get all the info I can! Jamie - It is a great read, if only for the websites listed. And I loved the first hand experience. With your love of travel things, you will really like it! Jess- I have not heard about Vagabonding. I'll have to add that to my TBR. I'm going to be traveling a lot for my job (soon hopefully) so I'm gearing up for any kind of travel read! Tahleen - I would really recommend it! It has some great resources and may be able to set your mind a little at ease about traveling solo! Jo--It makes me nervous too! It's always my boyfriend and I but I've never done it by myself! That will be the ultimate test to see if I'm a real traveler! I've gone abroad by myself, but I was in a study abroad group, so I was never really alone. I was alone initially but made friends pretty fast. That said, when I was there I never traveled alone. In Korea I did a teeny bit though. This sounds like a really interesting book! I'll definitley be adding it to my TBR! I love to travel but I'm afraid to go somewhere overseas alone (and I can't find anyone to drag along). I've noticed most travel books go over passports/visas and what to pack (they all say pack your suitcase and then take half of the things out of it!). But this does sound like a helpful book! Jen--I have the same problem! I can never find anyone to drag along!